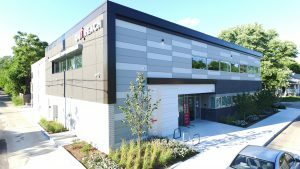 2017 IBJ Monumental Award for Neighborhood Revitalization goes to Outreach, Inc.
Congratulations to the team that helped to make this project come to life. Every year CCS allows each company the opportunity to honor and recognize one of their own for their safety efforts on the job. The criteria for the award is on a per company basis limited to one honoree. The Outstanding Craftsperson Award for 2017 goes to Duke Newlin! As part of the honor, Duke received a Carhartt hooded winter jacket embroidered with the CCS logo and “Outstanding Craftsperson 2017”. Congratulations on a well deserved award Duke! The CCS Awards Banquet was held Thursday May 4th this past year at the convention center in downtown Indianapolis. The annual banquet honors excellence in safety on the job to various companies and individuals. 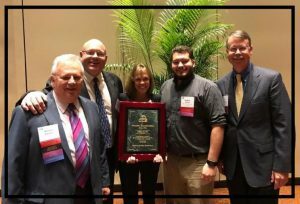 Wurster Construction was fortunate, and honored, to be presented with a Zero Injury Award for 2016! Another year with no injuries! Keep up the ‘safe’ work! Fatalities caused by falls from elevation continue to be a leading cause of death for construction employees, accounting for 350 of the 937 construction fatalities recorded in 2015. 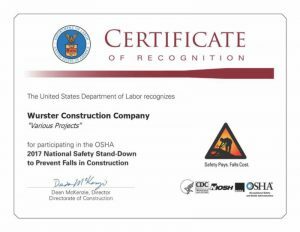 Recently, Wurster Construction participated (company-wide) in the 2017 National Safety Stand Down to Prevent Falls in Construction. The National Fall Prevention Stand-Down raises fall hazard awareness across the country in an effort to stop fall fatalities and injuries. 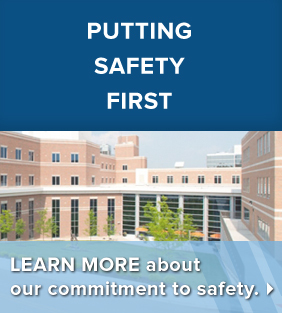 The Safety Stand-Down was a voluntary event for Wurster. In collaboration with Safety Management Group to talk directly to our employees and subcontractors specially about fall protection an safety. 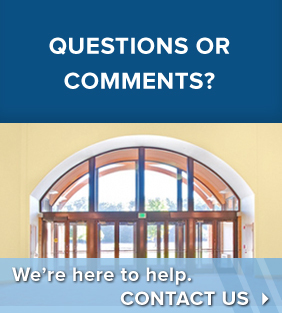 The national program offered Wurster Construction the opportunity to have a conversation with our project teams on all our jobsites about hazards, protective methods, and the company’s safety policies and goals. 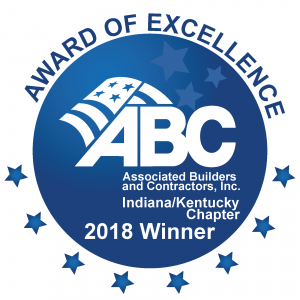 Wurster Construction is pleased to have received a certificate of recognition for participating with the US Department of Labor and OSHA in completing the National Safety Sand Down in 2017. Wurster Construction learned, first hand, how world changing research helps Indianapolis to shed the reference as “India-No-Place”. Indianapolis is fortunate to have residents with the brain power, the gumption and the dollars to help solve the world’s problems. 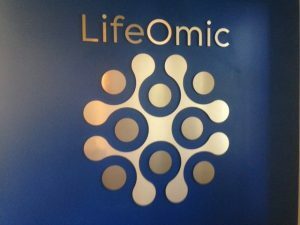 Founded by Don Brown, LifeOmic strives to produce results that could be earth shattering for the treatment of cancer and other diseases known to have to our personal genetic footprint. Click on the link below to read more about this exciting, and risky, new medical research and development. 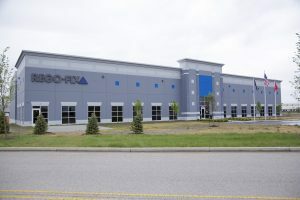 Wurster Construction finalized completion on REGO-FIX’s new 20,000-sq.-ft. headquarters. 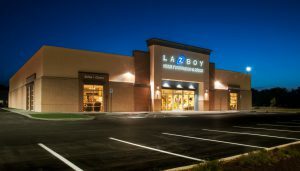 Grand Opening was on Friday, May 5, 2017. Great job Wurster Team! 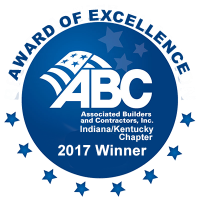 The annual Indiana Subcontractors Association tradeshow was held Wednesday, March 1st in downtown Indianapolis followed by the annual Awards Banquet at the J.W. Marriott. 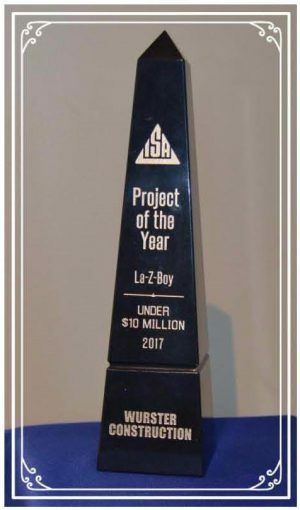 Wurster Construction was fortunate to be recognized at the annual event for Project of the Year-Under $10 Million for La-Z-Boy Furniture Showroom. 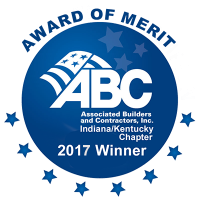 Congratulations to Joe Burgess, Ed Stevens, Dave Bates, and Jim Woodworth for delivering an award winning project! 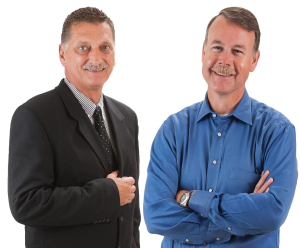 Happy 30th Anniversary to Al Wurster! 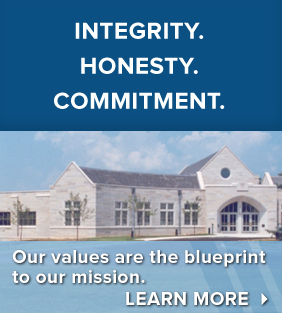 It’s hard to believe it’s been 30 years already and Wurster Construction continues to grow. 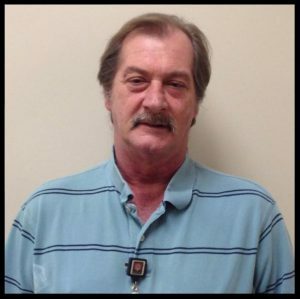 Many employees, and ‘friends of the company’, know that Al is an avid fan of the Indianapolis 500 and the Indianapolis Motor Speedway. 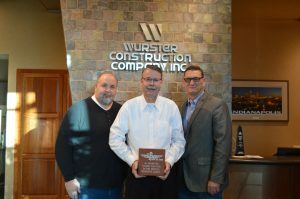 To celebrate Al’s 30th Anniversary, the Wurster Construction Family presented Al with a commemorative brick which will be placed in the Pagoda Courtyard at the Indianapolis Motor Speedway. Congratulations Al and thank you for the last 30 years and everything you have done, and continue to do, for Wurster Construction!